OK. You have your Halloween party tonight. You did not prepare. You never prepare. Why are you like this? This is exactly what your mom/partner/therapist is talking about. You could have easily Googled "Awesome and Funny 2017 Halloween Costumes" two weeks ago, ordered what you needed, and been the hypothetical belle of the whatever Halloween ball you need to attend. Now you just have to grab a bunch of stuff around your place and pray the rest of the party appreciates your laissez-faire, devil-don't-give-no-shits 'tude. But it's cool. Because these last-minute, super lazy costumes are almost certainly better than anything else all those other normies are painstakingly planned. And if there's one thing better than doing a great job, it's doing a great job at the last minute without really trying hard at all. Right? Basically, all you need to do is put some kind of fake fire into a shirt with a breast pocket. And, carry around a bunch of Hot Pockets. This costume works on a few levels. First off, it's a pun. Secondly, you get to eat Hot Pockets. It's a very effective way to make new friends and influence people. -- Fake fire. There's a few ways to do this: You can cut out some red construction paper, if you have it. 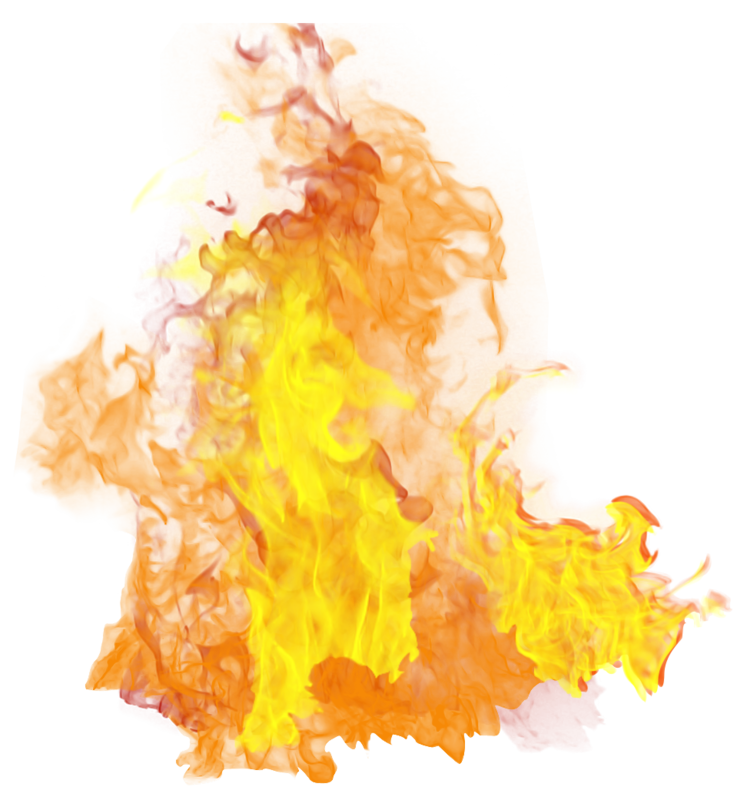 Or you can print out a picture of a flame, and just cut it out. Or use red streamers. Or just cut out a chunk of your favorite Guy Fieri tribute shirt. -- Hot Pockets. Preferably ham and cheese. So, you get a bunch of name tags, write other people's names on them, and stick 'em all over your bod. Another pun! Only this time, it's about something serious. Oh well. At least you get to make up a lot of fake names. Start with "Rod Domino!" -- So, you can basically wear whatever you want. But we recommend a suit, as it's assumed thats what identity thieves wear. 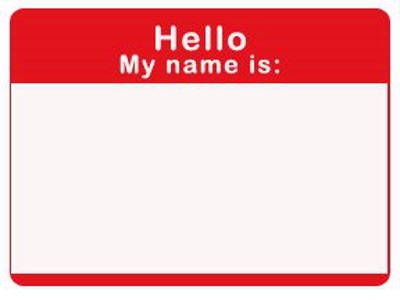 -- Name tags. But since they are kind of hard to come by, here is a template you can print out. 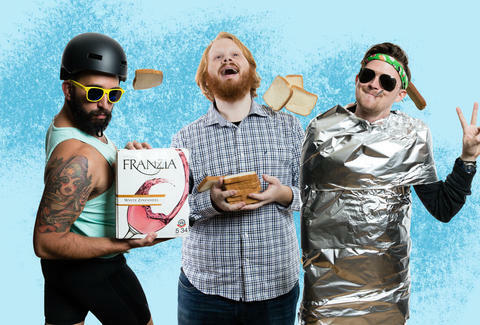 The only performance enhancing drug this professional cyclist needs is everyone's favorite boxed wine. But also, maybe steroids. You need to fit into those spandex, right? Oh, this is also a pun. For this one, you might need a little bit of time. But not much. You need to acquire green or purple balloons and a bunch of tape. 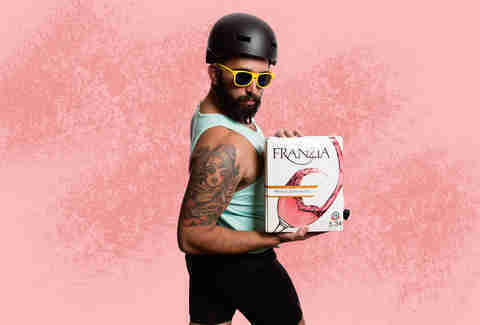 For extra credit, grab some wine from that Franzia bike dude. Superheroes are, objectively, so hot right now. And if you've ever gotten rowdy at a shindig and put a lampshade on your noggin' (congrats! ), you know how fun it is to be the life of the party. This combines both. It's another pun, you see. To quote Justin Bieber: "I'm sorry, yeah. Sorry, yeah. Sorry." It's like that, with a suit on. Also a pun. Are you seeing a pattern yet? -- Sign that says "I'm Sorry." This is a pun that will capture the imagination of every youth between the age of 16-30. And also you can dance like nobody's watching even if everyone is watching. And judging. 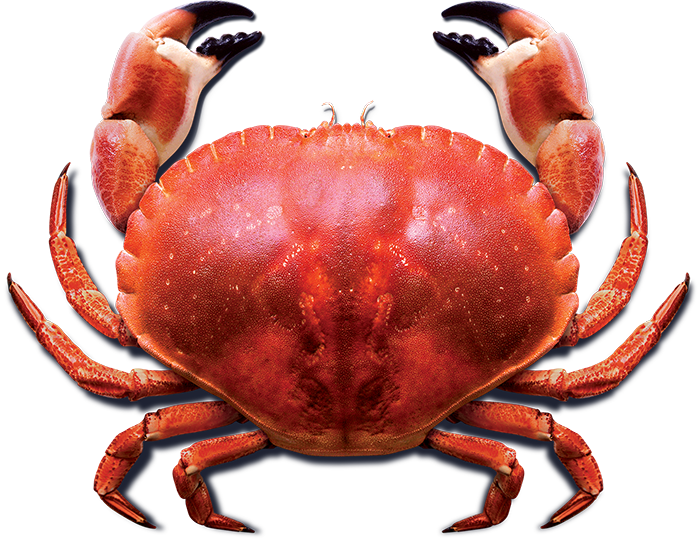 Print out dozens of pictures of crabs. Hand them out at your party. Stuff them in every jacket pocket, and in random places around the room. You just gave everyone crabs. So, this one is kind of niche, as you need to have flaming red hair. But it is funny. 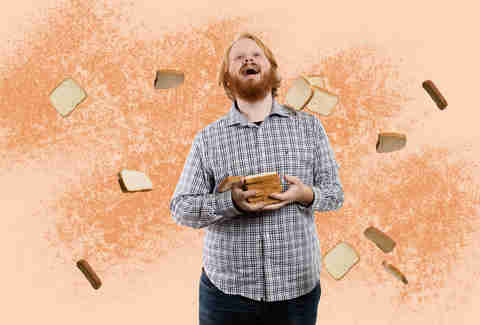 And you get to hand out bread to the public. Also, a pun. A lot of these are puns. If you haven't noticed. This should be self-explanatory. It's easier if you live at home. This is it. The final pun. We've made it, folks. 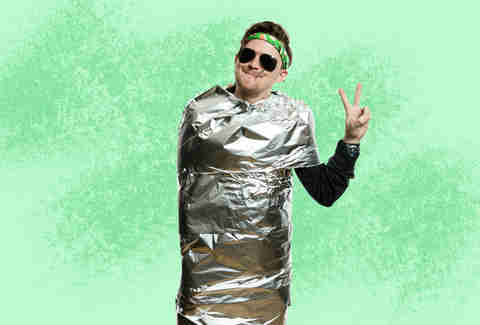 This is also the easiest costume on the list. Though, it can give people the wrong impression. Like law enforcement, for example.